It’s hard to believe that we are already into November, particularly as the days have been really balmy over the last week. We are still enjoying lunches outside on the upper terrace and marvelling at the peace and quiet after the vendemia (grape harvest). The olive picking has now really got going and it has been an unusual year with both harvests so close together. Farty Barty, the cat, is getting far too plump as he builds his winter coat and fat layers. In no time at all he will be off courting and running himself ragged again. Yes, I know, at six years of age, he still has his vital bits. The problem is, whenever we try to trap him in his cage, he knowingly disappears off into the wild for four or five days! Now my man feels that, at such a mature age a male’s important bits should be left well alone! Orange harvest from the orchard. The garden continues to amaze us with new growth on many of the flowering plants and shrubs. 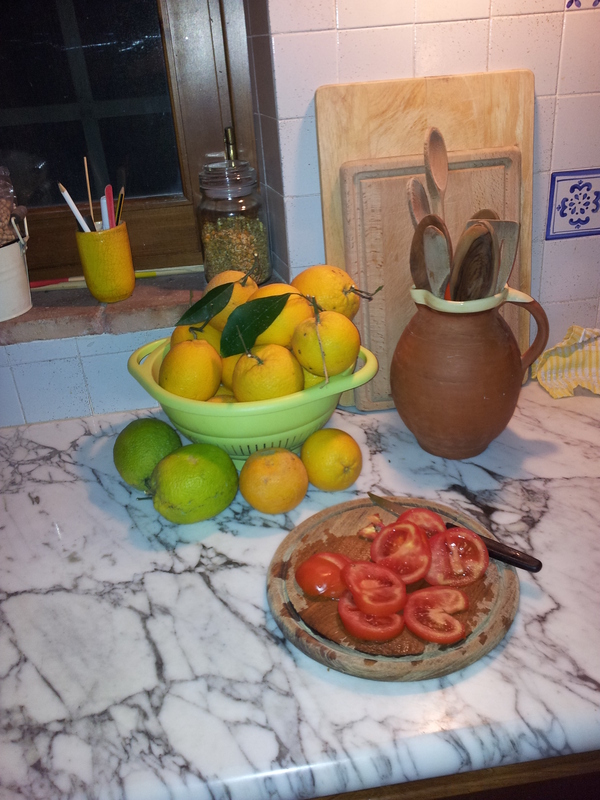 The potted lemon trees are sporting autumn blossoms and the oranges from the orchard are huge and juicy. 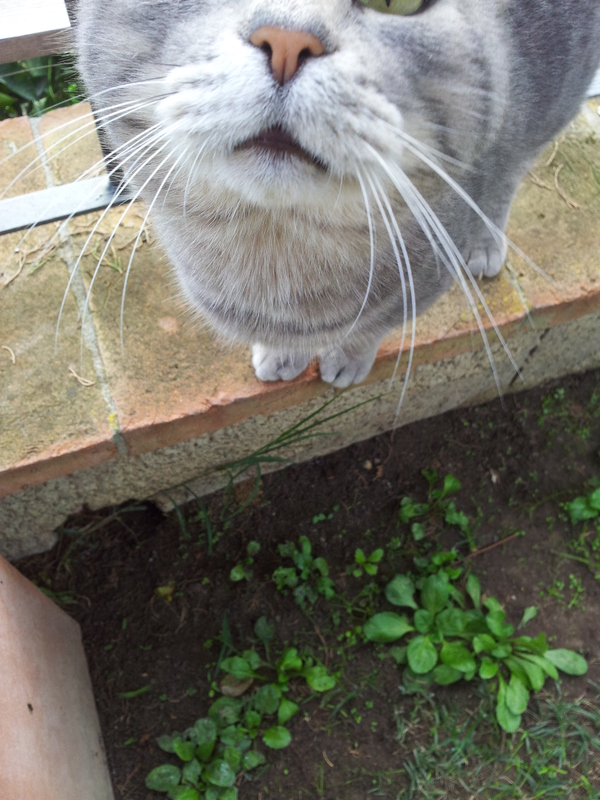 The man is very happy, of course, because there is still plenty to do outside. In addition to this, we are decorating the spare bedroom for our discerning friends & family that will be here before and over Christmas. These things may not be exciting to you, however, my man and I spend a lot of hours each week doing brain work, so it is a joy to turn one’s attention to practical stuff. Back at the Laura’s bar/alimentari in Fiano, Tuesday was a day for the locals to burst into song. It was a case of the conversation suddenly inspiring a song (mostly Italian) and short bursts of pop, rock or ballads were sung with gusto. I threw in a few English lyrics and it was great fun! Friday was a festa (All Saints Day/Day of the Dead) and Halloween to you. 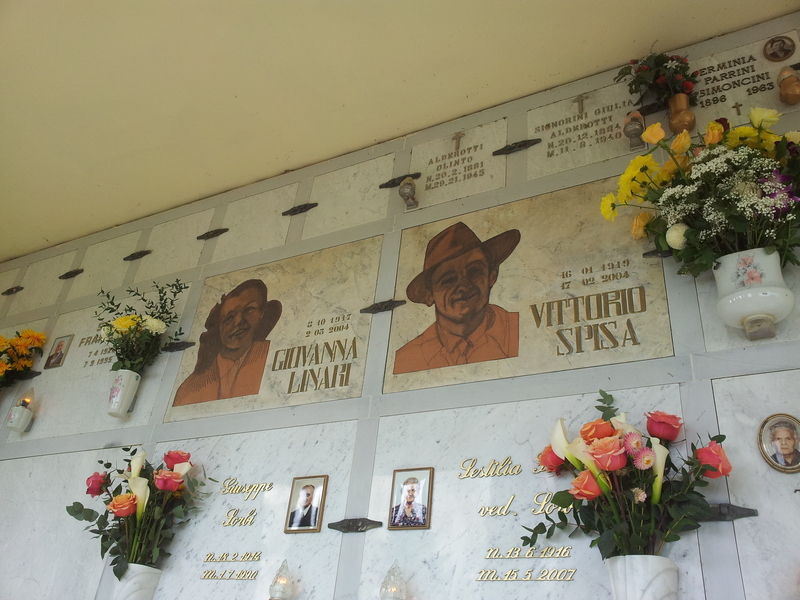 The churchyards are now full of fresh flowers and we particularly like to visit Giovanna & Vittorio’s memorial in Luccardo Alto, which has hand painted likenesses on the wall. if you have never visited an Italian churchyard, you really must. Each dearly departed has a photograph, and at night lovely little lamps let out a warm glow. Laura’s bar was closed that day, so we had morning coffee outside Bar Piazzetta and soaked up the glorious sunshine. Reading the paper there, we discover that Empoli, a town about half an hour away, has a Sherlock Holmes Society. How amazing is that? This is an all Italian group of people who just adore S.H! On Sunday we went to Montespertoli and, whilst enjoying our aperitivo in the Piazza, we met Rhett & Ginger, two lovely American ladies who were on holiday. Girls, if you are reading this, we hope you enjoy my book and the rest of your holiday! And so to Sunday lunch. 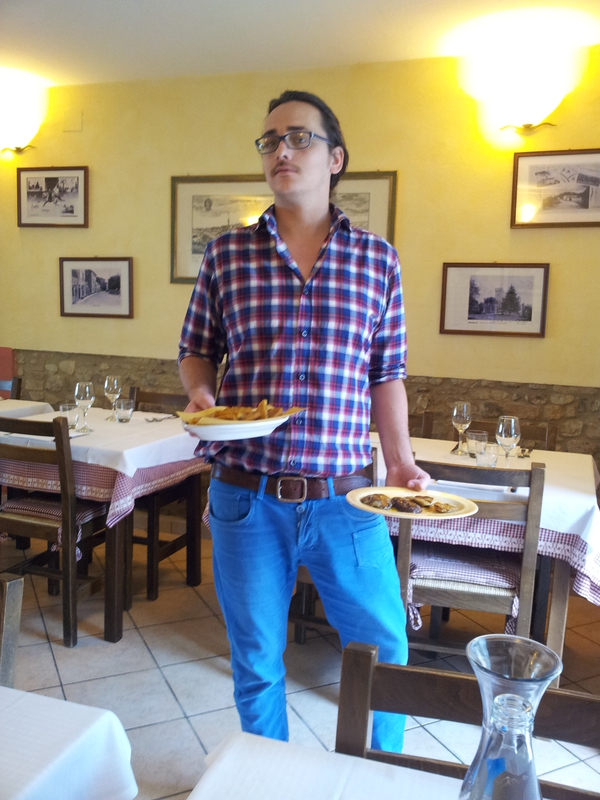 I have been meaning to introduce you to Gianluca who is a waiter at ‘C’era una Volta’ in Luccardo. Gianluca has been a temporary member of staff for around eleven years, as he is really a perpetual student of History. He is also very charming to girlies of all ages and speaks English, French, German and Spanish. We are very fond of him, however, he loves to stop and chat to us at some length, despite shouts from his boss Paolo to get on with serving the customers! You could say that he likes to perform for his favourite customers, which regularly gets him into trouble! He is off to Cuba next week with his mates, and asked us for all the words for a joint! Did he mean a smoke or a seedy bar? We did our best to help. however, you need to travel these roads regularly to appreciate the precarious state of shifting land around us. 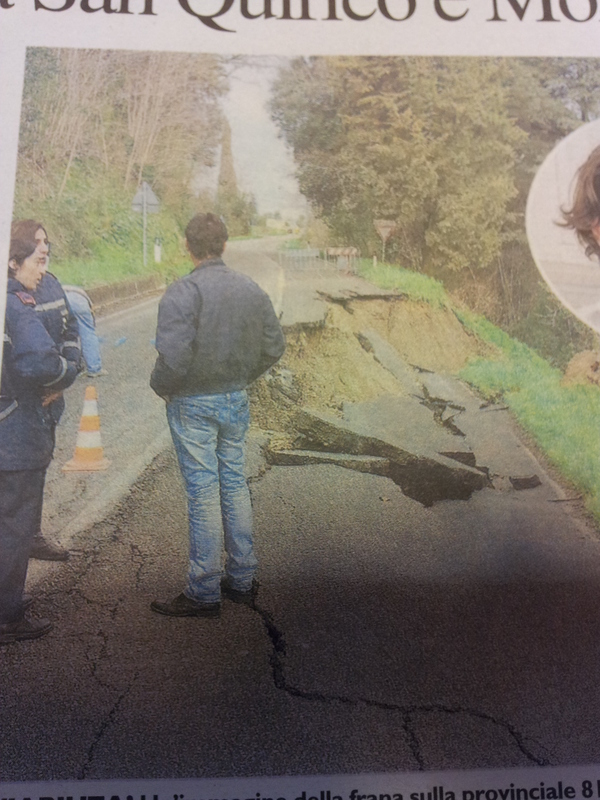 I won’t bore you too much with stories about Italian drivers, but this morning driving along the two kilometre stretch of strada bianca from our villa to the main road, we had to break three times as to avoid oncoming vehicles cutting bends at speed, over seriously eroded surfaces! Then we were overtaken by an elderly Signora, on a blind bend and it is a single track road! Enough of that, but sometimes one has to rent one’s feelings! I have just checked on the latest news for the gorgeous Silvio Berlusconi. Well, golly gosh, bunga-bunga girl Marythell Polanca has claimed that SB married his overage fiance Francesca Pascale three weeks ago, in a private chapel at his home! Francesca is currently seeking 10 million euros damages after a TV station broadcast claimed that, according to a Bulgarian Actress, she was a lesbian! Meanwhile, SB has managed to persuade the courts to reduce his alimony payments to his ex-wife by half. The poor wretch is now having to manage on only 1.2 million euros a month! So, nothing really sensational on Silvio’s front then. Enough for now. I really must get on with the day job and do a bit of business. Please get in touch, and if you have read my current book, do leave a review on Amazon or Goodreads. Thank you. PS You can now find me and ‘My Father, The Assassin’ on http://www.goodreads.com, http://www.firstchapters.net and of course on Amazon. Enjoy! Wow, it’s been an exciting week for Silvio! I always look forward to these updates and, like you, I can’t believe it’s November, we had a lovely lunch in the sun on Saturday! You sound as if life is a little more relaxed now; fantastico! Despite the air of calm and the ‘laid back’ lifestyle, we still work hard every week with the business http://www.hoareworth.com and of course my writing. But I would not change a thing!